As record amounts of plastic waste pollutes the planet, some grocers are helping shoppers do without. Tom and Katrin Helmick live in New York’s Hudson Valley region with their 2-year-old son. 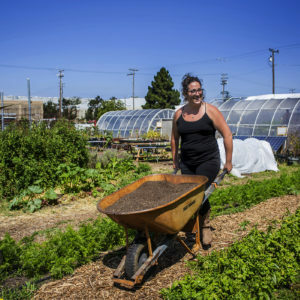 They cook and grow vegetables in their backyard during the summer months, bring reusable totes to the grocery store or farmers’ market, and never buy plastic bottled water. Although they try to avoid buying foods that come in non-recyclable packaging, their landfill waste bin still receives a hearty diet of disposable baby food pouches and “lots of thin plastic,” says Tom. “When we do buy grocery store meat, I hate that it still comes wrapped in Styrofoam. That’s why I love going directly to the source for our meat from a farm nearby that is simply vacuumed-packed,” says Tom. “We find it ridiculous that three people can create so much waste,” adds Katrin. Indeed, food packaging waste can seem like an inescapable fact of modern-day American life. According to the U.S. Environmental Protection Agency (EPA), the U.S. alone produced 33.3 million tons of plastic in 2014, an increase of nearly 2 million tons since 2010, and much of it came from the categories of durable goods, containers, and packaging. Global estimates suggest that as much as 80 percent of marine litter, most of it plastics, originate inland before finding their way into waterways, polluting our food sources and harming wildlife. What’s more, 70 percent of marine plastic has been found to be non-biodegradable, and it’s expected to triple by 2025, a report shows. In the face of these troubling realities, a movement toward zero-waste grocery shopping has been growing in the U.S. and beyond. For example, mom-and-pop grocery stores with extensive bulk goods and biodegradable or recyclable packaging such as in.gredients in Austin and The Zero Market in Denver. 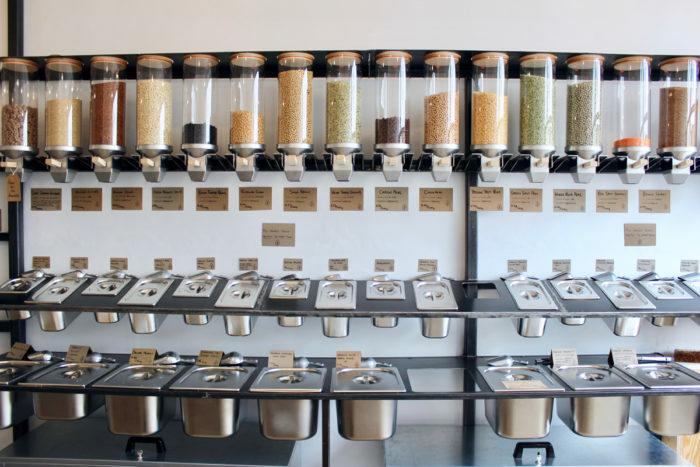 Across the Atlantic Ocean, Earth.Food.Love bills itself as the U.K.’s first zero-waste market, and Ekoplaza recently opened with the world’s first “plastic-free aisle” in the Netherlands. 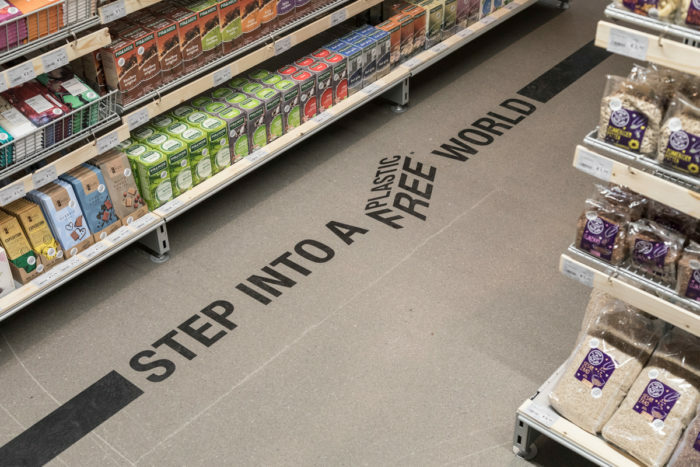 The nonprofit A Plastic Planet is behind the plastic-free aisle, an initiative it hopes to replicate in stores worldwide. “Where is the logic in wrapping something as fleeting as food in something as indestructible as plastic?” asks Sian Sutherland, co-founder of A Plastic Planet. Participants in the zero-waste movement are pursuing a number of strategies and business models to eliminate waste from the shopping experience entirely. For Celia Ristow, who co-founded the advocacy group Zero Waste Chicago and writes the blog Litterless, the phrase “zero waste” is more of an ideal than a hard-lined rule. 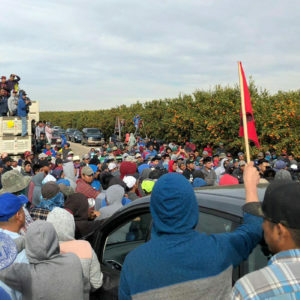 “It’s so geographically dependent on what’s in your area—some areas have more resources, some don’t—so I think it’s about doing your best to leverage the resources you do have,” she says. As a former marine biologist, Miller has seen firsthand the effects of plastic waste on dolphins, whales, and the entire ocean. “I decided that I wanted to do something to tackle the problem [of plastic] at the source,” she says. Her store, which was initially called the Zero Waste Market in 2015, is a first for Vancouver, a city with very progressive values to begin with. But Miller admits that its BYOC (bring-your-own-container) policies, bulk goods sold by weight, and refill programs require a major behavioral change from customers. Food co-ops, natural foods stores, and Whole Foods stores usually offer bulk dry goods like seeds, nuts, flours, grains, and beans, although they often require customers to use store-provided bags or containers. The goal of Nada Grocery and stores like it is to eliminate their own stock of single-use containers, and encourage customers to bulk up on dry goods, fruits, and vegetables by using their own packaging. For products like meats, dairy, condiments, and liquids, which are more difficult for consumers to parcel themselves, the store makes an exception to its bring-your-own requirement. Instead, Nada focuses more on finding suppliers who package goods in compostable or recyclable materials—and she offers a refundable deposit for people who bring back the packaging. 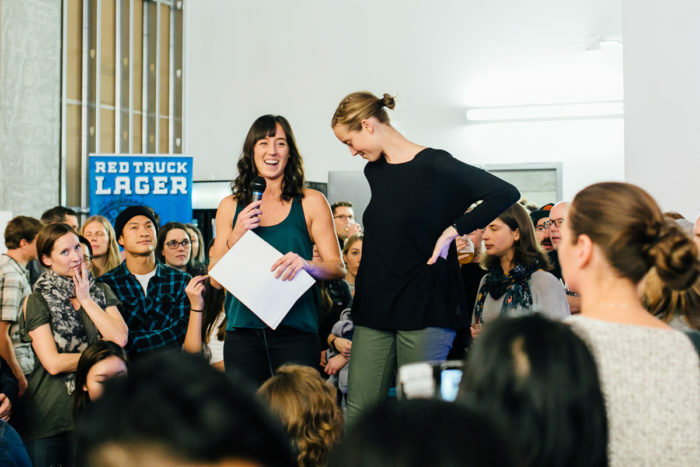 Much of her work involves asking small food producers—who are more nimble than large ones—to develop low-waste solutions of their own, she says. And it’s not just grocery stores going zero waste. Farmers’ markets have traditionally provided a low-waste alternative to food that spends days or weeks in transit or on shelves. Some markets have been launching their own zero-waste initiatives to leverage that advantage and increase awareness around the issue. Community-supported agriculture (CSA) programs, too, offer consumers food direct from farms, typically with a bring-your-own bag policy. And increasingly, cities have been adopting policies against single-use plastics—including thin-film bags, food containers, and even straws. These policies aim to make a bigger and faster impact than simply relying on shoppers and retailers to make the educated choice. 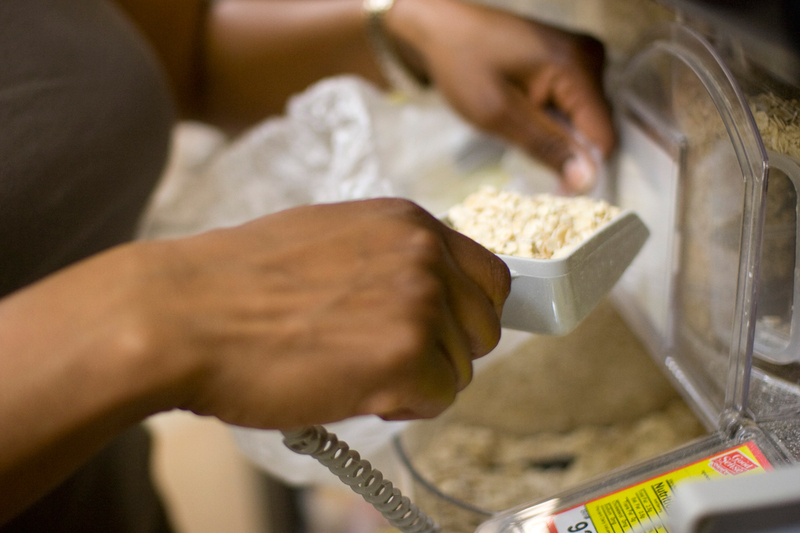 Buying in bulk is about more than just keeping plastic out of the landfill. “The theory … is that you’re not paying for the packaging, advertising, and branding that goes on to the shelf,” says Ristow. This should make products less expensive to produce and hence cost less to consumers, and Ristow finds that this generally holds true. What’s more, the ability to buy as much of an ingredient as you need can also lead to less waste. Still, some challenges stand in the way. Though many items are relatively easy to offer in a low-waste manner, some grocery stores view bulk buying as a potential health hazard to avoid at all costs—bulk bins need to be routinely cleaned and even so, some customers, like Tom and Katrin Helmick, are concerned about possible cross-contamination and avoid them just in case. And, not providing containers presents a lost opportunity in sales for customers who don’t plan ahead. Additionally, the relatively small number of retail and wholesale suppliers who are committed to adapting to low-waste packaging, as well as consumer awareness about best practices, can also present challenges. “When you’ve never bought a produce bag before, you kind of have to build that habit,” says Ristow. “But then it becomes second nature.” After all, low-waste shopping is not a new concept—it’s what grocery shopping looked like 100 years ago. For customers who don’t live near a store like Nada Grocery, Ristow says it’s all about getting to know what’s in their area—figuring out which butcher stores and bakeries use paper instead of plastic, for example—and shopping with an eye toward cutting down on waste. And what to do about eggs? Tom and Katrin Helmick try to buy eggs from farmers who take their cartons back and reuse them. They also skip Styrofoam cartons, which cannot be recycled. Sarah Metz has been working to open a zero-waste grocery store in Brooklyn called The Fillery for more than a year and a half. Thanks to New York City’s notoriously high rents and demanding regulations, she has lost out on six commercial spaces so far. But she’s motivated by the support she’s garnered from a Kickstarter campaign and local partners like the Brooklyn Public Library’s business plan competition. She envisions her store filling a gap she in her neighborhood of Prospect Heights. Even though neighboring Park Slope has a famous food co-op offering some foods in bulk, a grocery store dedicated to zero-waste packaging would be novel in any part of the city. “I talked and talked about [the need for a zero-waste store], and finally, my friends told me I should just do it myself,” says Metz. 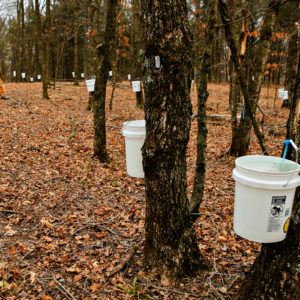 As a consumer, Metz makes her own yogurt to avoid individual plastic cups, returns her maple syrup jars at the farmers’ market, and talks to produce suppliers to find out when they transfer produce into styrofoam containers, so she can visit the store right before they do. 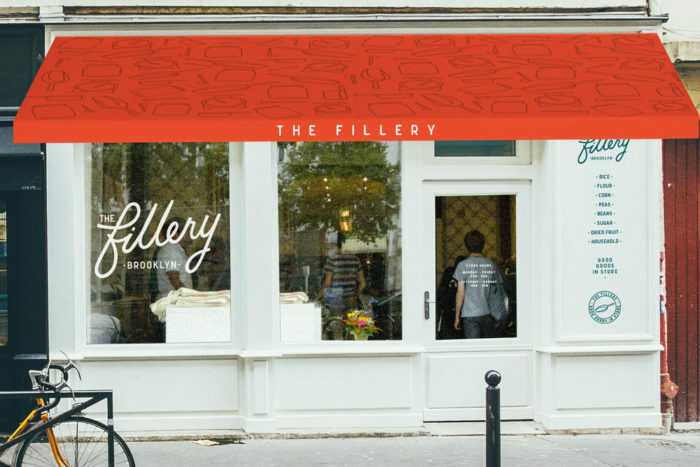 For The Fillery, she is focusing on neighborhoods that don’t have many great grocery stores. “I want it to be both logistically and economically sustainable,” she says. Despite the many challenges, Metz thinks Brooklyn is ready for the change. She says she has heard a lot of interest from the community—especially from young people. Top photo CC-licensed by MPCA Photos. In your research for this article, did you come across any zero waste initiatives or grocers in the Greater Boston area? Wow. GREAT ideas. Would like to incorporate some of these in Omaha. Not that hard --we bring wide mouth jars for nuts, granola, rice, quinoa, oats, etc, and clearly labelled with name of item, PLU# (or SKU#) and the tare (weigh bottle and cap once, make a label for the tare for future visits, at our local food co-op, just like we bring a half dozen canvas bags to carry it all home. Not a plAstic bag in sight!! Not riding a subway (rural Maine) so these go in car. Wash jars as needed--rice seldom, granola more often... State law smartly does not allow used containers for "ready to eat" foods like bulk peanut butter and salads, but we wash and reuse these at home for leftovers at home until cracked or worn. I would not want other customers handling things like open peanut butter before me anyway--I have had food "poisoning" (poor sanitation) way too many times in life to play around with my health. Hi Civil Eats thanks for sharing the wonderful insights. Glad to see your blog. We share the same core values. We Packnwood create food packaging using natural, organic and recyclable materials. Smooth and elegant finished products, all while preserving the environment!